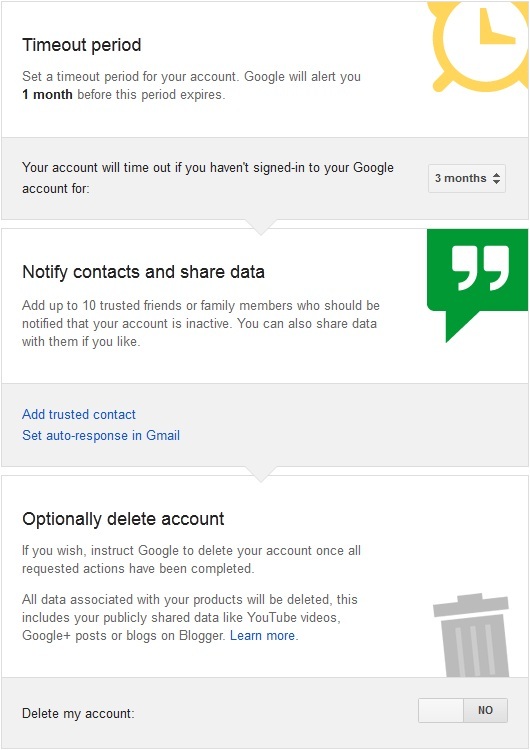 Setup Google Account for Sharing / Deletion after Death or Inactivity – "Inactive Account Manager"
Google has got a section named Inactive Account Manager, where a user can set his account for deletion, sharing or few other fates if at all you set it up and have a time limit set for your inactivity, and this happens only if you have decided not to use your Google account at all, or during any unfortunate reasons such as Death. The user can choose to get alerts on their mobile phone for the inactivity, or notify the selected contacts and share the data, and to optionally delete the account if they wish not to share their data with anyone else. 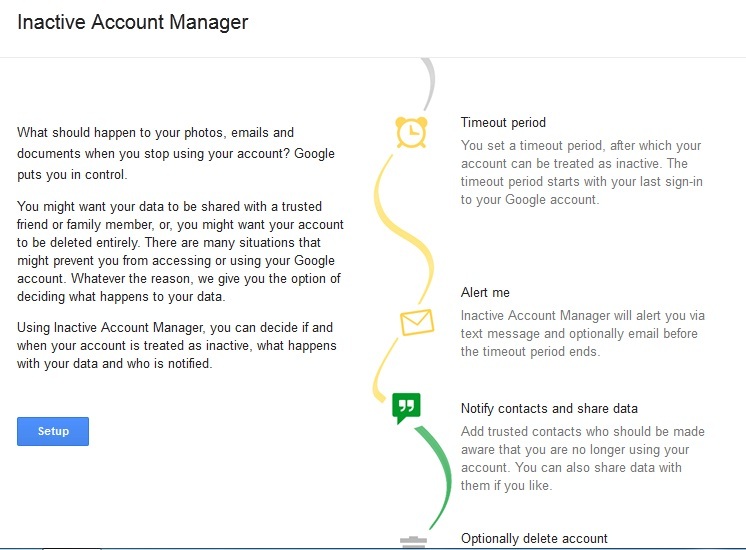 Here”s how one can use the Inactive Account Manager, and set up the various options to decide the fate of the Google Account when it”s not been used for a long time, set by the user. Provide a mobile phone number to be alerted before any actions will be performed on your account. You will need to add a phone number and verify it to have the alerts turned on, so that you receive an SMS from Google after a particular time when the account is not active at all. An additional Email Address can also be set by the user to receive an E-mail there about the inactivity. Set a timeout period for your online casino account. Google will alert you 1 month before this period expires. There is a timeout period that the user can set, after which the action would be taken which you wanted Google to take for the account. 1 month before the timeout, a mail or SMS would be sent to the user. Add up to 10 trusted friends or family members who should be notified that your account is inactive. You can also share data with them if you like. 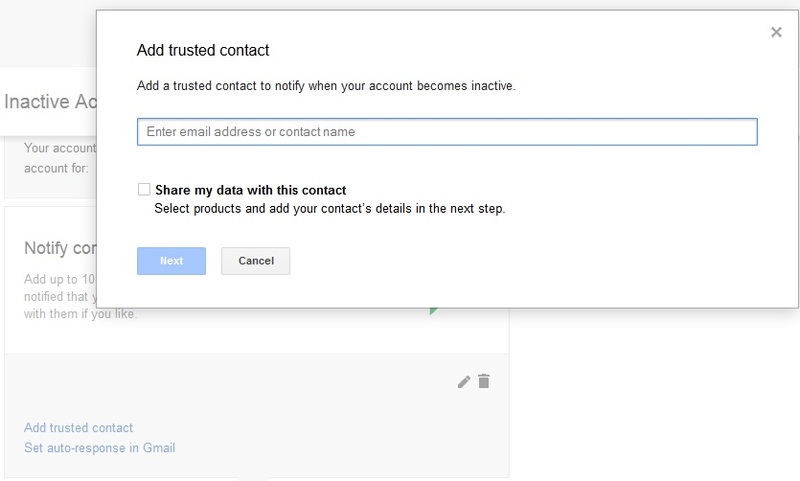 For this to happen, you need to add anywhere from 1 to 10 trusted contacts, and keep an Email ready with the Subject and Email content so that it is sent when the set timeout is finished and the owner hasn”t still accessed the account. Set auto-response in Gmail – Send an automated response to all incoming messages once your account becomes inactive. If a contact sends you several messages, this automated reply will be sent at most once every 4 days. There”s even an option where the user can set the account to auto-reply only if the mail has come from one of the contacts of the account. Having said all this, we again mention that this Account Manager would come handy especially when you are dead and you have got quite a lot of personal information which can be shared with the family, and which could come to some use to them. Google after all isn”t just throwing things away after you are gone, it”s for you to decide whether to share the stuff or not. Finally, after all the options there”s one to Delete the account after the timeout. This is for those who wish not to share anything in case there is something unfortunate happening. The deletion would include the Gmail, the shared data like the Youtube videos, the Blogger blogs and also the Google Plus posts. Choose this as an option if you wished to delete everything and not share it if you didn”t to continue using your Google account, or in the rare cases, after the death.